Whenever we hear the computer's name, we have many thoughts in our mind because we can easily do any work by this computer because the computer can easily do hundreds of work in 1 minute, it will be difficult to put the computer in words because Every person does the work of the computer differently, somehow somehow somehow the computer works differently for every person. Now the computer has to know the introduction of the computer. 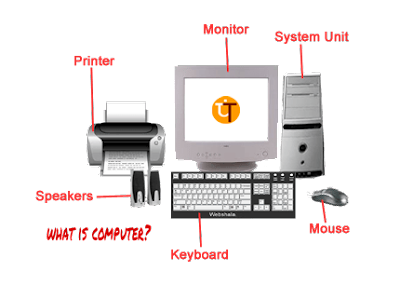 It does a lot of work, but it does not do all its work, the computer needs a lot of parts, which is shipped to me about the different parts of the shoftware and hardware computer. Printer-The printer is an output tool with the help of different data from the computer printed in a paper. With this help we can print the computer information in paper. Syster unit-The system unit is also called a CPU, it is the brain of the computer that looks like a box, it has a motherboard and processor etc. It has a computer control. Speakers-With the help of the speaker, we can listen to the computer's voice and with its help we can hear the sound of the songs from our computer.